With the National Security Strategy recognising that cyber security is one of the most serious threats facing Britain today, the BCI’s finding that cyber attack has risen to become a top three source of disruption in the Financial Services sector and 2011 seeing the publication of the UK’s new Cyber Security Strategy; it is clear the time to prepare for cyber attack is running out. Deloitte are more engaged than ever in helping organisations enhance their cyber preparedness and advocate this process as a crucial element to economic success and business survival. 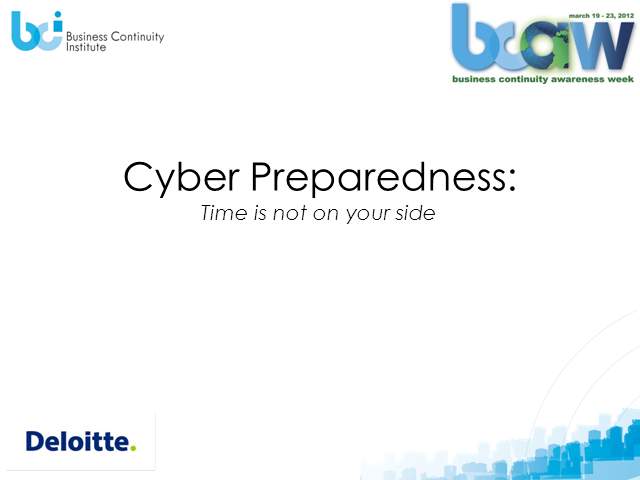 Amy will examine the cyber threat, the challenges it presents and provide an overview of Deloitte’s approach to cyber preparedness, including an insight into their methodology.